‘The tail of the log of the database <mydatabase< has not been backed up – Meaning there are transactions in the log that need to be backed up. ‘USE BACKUPLOG WITH NORECOVERY’ if you want to backup the log and it contains work you don’t want to lose. ‘- It tells exactly what should user do in case he needs the older copy. 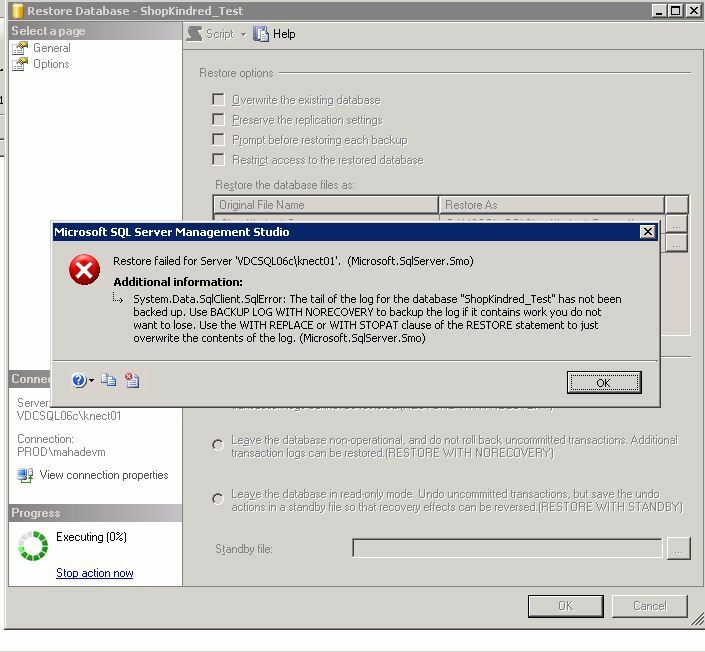 ‘USE WITH REPLACE OR WITH STOPAT CLAUSE OF THE RESTORE STATEMENT TO JUST OVERWRITE THE CONTENTS OF THE LOG’ – in other words if am using the GUI I better check the box to tell sQL Server to overwrite the existing database, if that is what I intend to do. This message tells me what is wrong and also evaluates the two possibilities – I want to keep or discard the old copy of the database, and tells me what to do in both situations. It is an excellent example of user friendly error messages.